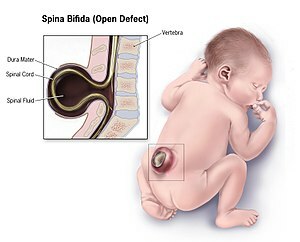 Spina bifida is a birth defect where there is incomplete closing of the backbone and membranes around the spinal cord. There are three main types: spina bifida occulta, meningocele, and myelomeningocele. The most common location is the lower back, but in rare cases it may be the middle back or neck. Occulta has no or only mild signs. Signs of occulta may include a hairy patch, dimple, dark spot, or swelling on the back at the site of the gap in the spine. Meningocele typically causes mild problems with a sac of fluid present at the gap in the spine. Myelomeningocele, also known as open spina bifida, is the most severe form. Associated problems include poor ability to walk, problems with bladder or bowel control, accumulation of fluid in the brain (hydrocephalus), a tethered spinal cord, and latex allergy. Learning problems are relatively uncommon. Spina bifida is believed to be due to a combination of genetic and environmental factors. After having one child with the condition or if one of the parents has the condition, there is a 4% chance that the next child will also be affected. Not having enough folate in the diet before and during pregnancy also plays a significant role. Other risk factors include certain antiseizure medications, obesity, and poorly controlled diabetes. Diagnosis may occur either before or after a child is born. Before birth if a blood test or amniocentesis finds a high level of alpha-fetoprotein (AFP), there is a higher risk of spina bifida. Ultrasound examination may also detect the problem. Medical imaging can confirm the diagnosis after birth. Spina bifida is a type of neural tube defect related to but distinct from other types such as anencephaly and encephalocele. Most cases of spina bifida can be prevented if the mother gets enough folate before and during pregnancy. Adding folic acid to flour has been found to be effective for most women. Open spina bifida can be surgically closed before or after birth. A shunt may be needed in those with hydrocephalus, and a tethered spinal cord may be surgically repaired. Devices to help with movement such as crutches or wheelchairs may be useful. Urinary catheterization may also be needed. About 15% of people have spina bifida occulta. Rates of other types of spina bifida vary significantly by country, from 0.1 to 5 per 1000 births. On average in developed countries, including the United States, it occurs in about 0.4 per 1000 births. In India it affects about 1.9 per 1000 births. Caucasians are at higher risk compared to black people. The term is Latin for "split spine". There are two types: spina bifida occulta and spina bifida cystica. Spina bifida cystica can then be broken down into meningocele and myelomeningocele. Occulta is Latin for "hidden". This is the mildest form of spina bifida. In occulta, the outer part of some of the vertebrae is not completely closed. The splits in the vertebrae are so small that the spinal cord does not protrude. The skin at the site of the lesion may be normal, or it may have some hair growing from it; there may be a dimple in the skin, or a birthmark. Unlike most other types of neural tube defects, spina bifida occulta is not associated with increased AFP, a common screening tool used to detect neural tube defects in utero. This is because, unlike most of the other neural tube defects, the dural lining is maintained. Many people with this type of spina bifida do not even know they have it, as the condition is asymptomatic in most cases. About 15% of people have spina bifida occulta, and most people are diagnosed incidentally from spinal X-rays. A systematic review of radiographic research studies found no relationship between spina bifida occulta and back pain. More recent studies not included in the review support the negative findings. However, other studies suggest spina bifida occulta is not always harmless. One study found that among patients with back pain, severity is worse if spina bifida occulta is present. Among females, this could be mistaken for dysmenorrhea. Incomplete posterior fusion is not a true spina bifida, and is very rarely of neurological significance. A posterior meningocele (/mɪˈnɪŋɡəˌsiːl/) or meningeal cyst (/mɪˈnɪndʒiəl/) is the least common form of spina bifida. In this form, a single developmental defect allows the meninges to herniate between the vertebrae. As the nervous system remains undamaged, individuals with meningocele are unlikely to suffer long-term health problems, although cases of tethered cord have been reported. 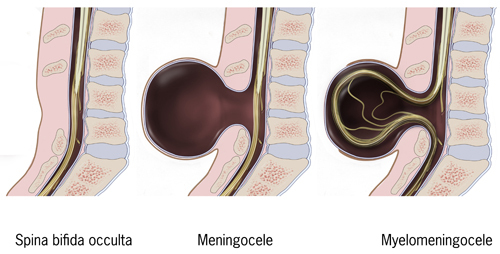 Causes of meningocele include teratoma and other tumors of the sacrococcyx and of the presacral space, and Currarino syndrome. A meningocele may also form through dehiscences in the base of the skull. These may be classified by their localisation to occipital, frontoethmoidal, or nasal. Endonasal meningoceles lie at the roof of the nasal cavity and may be mistaken for a nasal polyp. They are treated surgically. Encephalomeningoceles are classified in the same way and also contain brain tissue. Myelomeningocele (MMC), also known as meningomyelocele, is the type of spina bifida that often results in the most severe complications and affects the meninges and nerves. In individuals with myelomeningocele, the unfused portion of the spinal column allows the spinal cord to protrude through an opening. Myelomeningocele occurs in the third week of embryonic development, during neural tube pore closure. MMC is a failure of this to occur completely. The meningeal membranes that cover the spinal cord also protrude through the opening, forming a sac enclosing the spinal elements, such as meninges, cerebrospinal fluid, and parts of the spinal cord and nerve roots. Myelomeningocele is also associated with Arnold-Chiari malformation, necessitating a VP shunt placement. Toxins associated with MMC formation include: calcium-channel blockers, carbamazepine, cytochalasins, hyperthermia, and valproic acid. Spina bifida with myelocele is the most severe form of myelomeningocele. In this type, the involved area is represented by a flattened, plate-like mass of nervous tissue with no overlying membrane. The exposure of these nerves and tissues make the baby more prone to life-threatening infections such as meningitis. The protruding portion of the spinal cord and the nerves that originate at that level of the cord are damaged or not properly developed. As a result, there is usually some degree of paralysis and loss of sensation below the level of the spinal cord defect. Thus, the more cranial the level of the defect, the more severe the associated nerve dysfunction and resultant paralysis may be. Symptoms may include ambulatory problems, loss of sensation, deformities of the hips, knees or feet, and loss of muscle tone. 68% of children with spina bifida have an allergy to latex, ranging from mild to life-threatening. The common use of latex in medical facilities makes this a particularly serious concern. The most common approach to avoid developing an allergy is to avoid contact with latex-containing products such as examination gloves and condoms and catheters that do not specify they are latex-free, and many other products, such as some commonly used by dentists. The spinal cord lesion or the scarring due to surgery may result in a tethered spinal cord. In some individuals, this causes significant traction and stress on the spinal cord and can lead to a worsening of associated paralysis, scoliosis, back pain, and worsening bowel and/or bladder function. Many individuals with spina bifida have an associated abnormality of the cerebellum, called the Arnold Chiari II malformation. In affected individuals, the back portion of the brain is displaced from the back of the skull down into the upper neck. In about 90% of the people with myelomeningocele, hydrocephalus also occurs because the displaced cerebellum interferes with the normal flow of cerebrospinal fluid, causing an excess of the fluid to accumulate. In fact, the cerebellum also tends to be smaller in individuals with spina bifida, especially for those with higher lesion levels. The corpus callosum is abnormally developed in 70–90% of individuals with spina bifida myelomeningocele; this affects the communication processes between the left and right brain hemispheres. Further, white matter tracts connecting posterior brain regions with anterior regions appear less organized. White matter tracts between frontal regions have also been found to be impaired. Cortex abnormalities may also be present. For example, frontal regions of the brain tend to be thicker than expected, while posterior and parietal regions are thinner. Thinner sections of the brain are also associated with increased cortical folding. Neurons within the cortex may also be displaced. Several studies have demonstrated difficulties with executive functions in youth with spina bifida, with greater deficits observed in youth with shunted hydrocephalus. Unlike typically developing children, youths with spina bifida do not tend to improve in their executive functioning as they grow older. Specific areas of difficulty in some individuals include planning, organizing, initiating, and working memory. Problem-solving, abstraction, and visual planning may also be impaired. Further, children with spina bifida may have poor cognitive flexibility. Although executive functions are often attributed to the frontal lobes of the brain, individuals with spina bifida have intact frontal lobes; therefore, other areas of the brain may be implicated. Individuals with spina bifida, especially those with shunted hydrocephalus, often have attention problems. Children with spina bifida and shunted hydrocephalus have higher rates of ADHD than children without those conditions (31% vs. 17%). Deficits have been observed for selective attention and focused attention, although poor motor speed may contribute to poor scores on tests of attention. Attention deficits may be evident at a very early age, as infants with spina bifida lag behind their peers in orienting to faces. Individuals with spina bifida may struggle academically, especially in the subjects of mathematics and reading. In one study, 60% of children with spina bifida were diagnosed with a learning disability. In addition to brain abnormalities directly related to various academic skills, achievement is likely affected by impaired attentional control and executive functioning. Children with spina bifida may perform well in elementary school, but begin to struggle as academic demands increase. Children with spina bifida are more likely than their peers without spina bifida to be dyscalculic. Individuals with spina bifida have demonstrated stable difficulties with arithmetic accuracy and speed, mathematical problem-solving, and general use and understanding of numbers in everyday life. Mathematics difficulties may be directly related to the thinning of the parietal lobes (regions implicated in mathematical functioning) and indirectly associated with deformities of the cerebellum and midbrain that affect other functions involved in mathematical skills. Further, higher numbers of shunt revisions are associated with poorer mathematics abilities. Working memory and inhibitory control deficiencies have been implicated for math difficulties, although visual-spatial difficulties are not likely involved. Early intervention to address mathematics difficulties and associated executive functions is crucial. Individuals with spina bifida tend to have better reading skills than mathematics skills. Children and adults with spina bifida have stronger abilities in reading accuracy than in reading comprehension. Comprehension may be especially impaired for text that requires an abstract synthesis of information rather than a more literal understanding. Individuals with spina bifida may have difficulty with writing due to deficits in fine motor control and working memory. Spina bifida is believed to be caused by a combination of genetic and environmental factors. After having one child with the condition, or if a parent has the condition, there is a 4% chance the next child will also be affected. A folic acid deficiency during pregnancy also plays a significant role. Other risk factors include certain antiseizure medications, obesity, and poorly managed diabetes. Drinking alcohol often triggers macrocytosis which discards folate. After stopping the drinking of alcohol, a time period of months is needed to rejuvenate bone marrow and recover from the macrocytosis. Those who are white or Hispanic have a higher risk. Girls are more prone to being born with spina bifida. Spina bifida is sometimes caused by the failure of the neural tube to close during the first month of embryonic development (often before the mother knows she is pregnant). Some forms are known to occur with primary conditions that cause raised central nervous system pressure, raising the possibility of a dual pathogenesis. In normal circumstances, the closure of the neural tube occurs around the 23rd (rostral closure) and 27th (caudal closure) day after fertilization. However, if something interferes and the tube fails to close properly, a neural tube defect will occur. Medications such as some anticonvulsants, diabetes, obesity, and having a relative with spina bifida can all affect the probability of neural tube malformation. Extensive evidence from mouse strains with spina bifida indicates that there is sometimes a genetic basis for the condition. Human spina bifida, like other human diseases, such as cancer, hypertension and atherosclerosis (coronary artery disease), likely results from the interaction of multiple genes and environmental factors. Research has shown the lack of folic acid (folate) is a contributing factor in the pathogenesis of neural tube defects, including spina bifida. Supplementation of the mother's diet with folate can reduce the incidence of neural tube defects by about 70%, and can also decrease the severity of these defects when they occur. It is unknown how or why folic acid has this effect. Spina bifida does not follow direct patterns of heredity as do muscular dystrophy or haemophilia. Studies show a woman having had one child with a neural tube defect such as spina bifida has about a 3% risk of having another affected child. This risk can be reduced with folic acid supplementation before pregnancy. For the general population, low-dose folic acid supplements are advised (0.4 mg/day). There is neither a single cause of spina bifida nor any known way to prevent it entirely. However, dietary supplementation with folic acid has been shown to be helpful in reducing the incidence of spina bifida. Sources of folic acid include whole grains, fortified breakfast cereals, dried beans, leaf vegetables and fruits. Folate fortification of enriched grain products has been mandatory in the United States since 1998. The U.S. Food and Drug Administration, Public Health Agency of Canada and UK recommended amount of folic acid for women of childbearing age and women planning to become pregnant is at least 0.4 mg/day of folic acid from at least three months before conception, and continued for the first 12 weeks of pregnancy. Women who have already had a baby with spina bifida or other type of neural tube defect, or are taking anticonvulsant medication, should take a higher dose of 4–5 mg/day. Certain mutations in the gene VANGL1 have been linked with spina bifida in some families with a history of the condition. Open spina bifida can usually be detected during pregnancy by fetal ultrasound. Increased levels of maternal serum alpha-fetoprotein (MSAFP) should be followed up by two tests – an ultrasound of the fetal spine and amniocentesis of the mother's amniotic fluid (to test for alpha-fetoprotein and acetylcholinesterase). AFP tests are now mandated by some state laws (including California). and failure to provide them can have legal ramifications. In one case, a man born with spina bifida was awarded a $2-million settlement after court found his mother's OBGYN negligent for not performing these tests. Spina bifida may be associated with other malformations as in dysmorphic syndromes, often resulting in spontaneous miscarriage. In the majority of cases, though, spina bifida is an isolated malformation. Genetic counseling and further genetic testing, such as amniocentesis, may be offered during the pregnancy, as some neural tube defects are associated with genetic disorders such as trisomy 18. Ultrasound screening for spina bifida is partly responsible for the decline in new cases, because many pregnancies are terminated out of fear that a newborn might have a poor future quality of life. With modern medical care, the quality of life of patients has greatly improved. Ultrasound view of the fetal spine at 21 weeks of pregnancy. In the longitudinal scan a lumbar myelomeningocele is seen. Anatomy scan of the fetal head at 20 weeks of pregnancy in a fetus affected by spina bifida. In the axial scan the characteristic lemon sign and banana sign are seen. There is no known cure for nerve damage caused by spina bifida. Standard treatment is surgery after delivery. This surgery aims to prevent further damage of the nervous tissue and to prevent infection; pediatric neurosurgeons operate to close the opening on the back. The spinal cord and its nerve roots are put back inside the spine and covered with meninges. In addition, a shunt may be surgically installed to provide a continuous drain for the excess cerebrospinal fluid produced in the brain, as happens with hydrocephalus. Shunts most commonly drain into the abdomen or chest wall. Standard treatment is after delivery. There is tentative evidence about treatment for severe disease before delivery while the baby is inside the womb. As of 2014 the evidence; however, remains insufficient to determine benefits and harms. Treatment of spina bifida during pregnancy is not without risk. To the mother, this includes scarring of the uterus. To the baby, there is the risk of preterm birth. Broadly, there are two forms of prenatal treatment. The first is open fetal surgery, where the uterus is opened and the spina bifida repair performed. The second is via fetoscopy. These techniques may be an option to standard therapy. Physiatrists coordinate the rehabilitation efforts of different therapists and prescribe specific therapies, adaptive equipment, or medications to encourage as high of a functional performance within the community as possible. Orthopedists monitor growth and development of bones, muscles, and joints. Neurosurgeons perform surgeries at birth and manage complications associated with tethered cord and hydrocephalus. Neurologists treat and evaluate nervous system issues, such as seizure disorders. Urologists to address kidney, bladder, and bowel dysfunction – many will need to manage their urinary systems with a program of catheterization. Bowel management programs aimed at improving elimination are also designed. Ophthalmologists evaluate and treat complications of the eyes. Orthotists design and customize various types of assistive technology, including braces, crutches, walkers, and wheelchairs to aid in mobility. As a general rule, the higher the level of the spina bifida defect, the more severe the paralysis, but paralysis does not always occur. Thus, those with low levels may need only short leg braces, whereas those with higher levels do best with a wheelchair, and some may be able to walk unaided. Physical therapists, occupational therapists, psychologists, and speech/language pathologists aid in rehabilitative therapies and increase independent living skills. Although many children's hospitals feature integrated multidisciplinary teams to coordinate healthcare of youth with spina bifida, the transition to adult healthcare can be difficult because the above healthcare professionals operate independently of each other, requiring separate appointments, and communicate among each other much less frequently. Healthcare professionals working with adults may also be less knowledgeable about spina bifida because it is considered a childhood chronic health condition. Due to the potential difficulties of the transition, adolescents with spina bifida and their families are encouraged to begin to prepare for the transition around ages 14–16, although this may vary depending on the adolescent's cognitive and physical abilities and available family support. The transition itself should be gradual and flexible. The adolescent's multidisciplinary treatment team may aid in the process by preparing comprehensive, up-to-date documents detailing the adolescent's medical care, including information about medications, surgery, therapies, and recommendations. A transition plan and aid in identifying adult healthcare professionals are also helpful to include in the transition process. Further complicating the transition process is the tendency for youths with spina bifida to be delayed in the development of autonomy, with boys particularly at risk for slower development of independence. An increased dependence on others (in particular family members) may interfere with the adolescent's self-management of health-related tasks, such as catheterization, bowel management, and taking medications. As part of the transition process, it is beneficial to begin discussions at an early age about educational and vocational goals, independent living, and community involvement. About 15% of people have spina bifida occulta. Rates of other types of spina bifida vary significantly by country from 0.1 to 5 per 1000 births. On average in developed countries it occurs in about 0.4 per 1000 births. In the United States it affected about 0.7 per 1000 births, and in India about 1.9 per 1000 births. Part of this difference is believed to be due to race, with Caucasians at higher risk, and part due to environmental factors. In the United States, rates are higher on the East Coast than on the West Coast, and higher in white people (one case per 1000 live births) than in black people (0.1–0.4 case per 1000 live births). Immigrants from Ireland have a higher incidence of spina bifida than do natives. Highest rates of the defect in the USA can be found in Hispanic youth. The highest incidence rates worldwide were found in Ireland and Wales, where three to four cases of myelomeningocele per 1000 population have been reported during the 1970s, along with more than six cases of anencephaly (both live births and stillbirths) per 1000 population. The reported overall incidence of myelomeningocele in the British Isles was 2.0–3.5 cases per 1000 births. Since then, the rate has fallen dramatically with 0.15 per 1000 live births reported in 1998, though this decline is partially accounted for because some fetuses are aborted when tests show signs of spina bifida (see Pregnancy screening above). 1980 – Fetal surgical techniques using animal models were first developed at the University of California, San Francisco by Michael R. Harrison, N. Scott Adzick and research colleagues. 1994 – A surgical model that simulates the human disease is the fetal lamb model of myelomeningocele (MMC) introduced by Meuli and Adzick in 1994. The MMC-like defect was surgically created at 75 days of gestation (term 145 to 150 days) by a lumbo-sacral laminectomy. Approximately 3 weeks after creation of the defect a reversed latissimus dorsi flap was used to cover the exposed neural placode and the animals were delivered by cesarean section just prior term. Human MMC-like lesions with similar neurological deficit were found in the control newborn lambs. In contrast, animals that underwent closure had near-normal neurological function and well-preserved cytoarchitecture of the covered spinal cord on histopathological examination. Despite mild paraparesis, they were able to stand, walk, perform demanding motor test and demonstrated no signs of incontinence. Furthermore, sensory function of the hind limbs was present clinically and confirmed electrophysiologically. Further studies showed that this model, when combined with a lumbar spinal cord myelotomy leads to the hindbrain herniation characteristic of the Chiari II malformation and that in utero surgery restores normal hindbrain anatomy by stopping the leak of cerebrospinal fluid through the myelomeningocele lesion. Surgeons at Vanderbilt University, led by Joseph Bruner, attempted to close spina bifida in 4 human fetuses using a skin graft from the mother using a laparoscope. Four cases were performed before stopping the procedure - two of the four fetuses died. 1998 – N. Scott Adzick and team at The Children's Hospital of Philadelphia performed open fetal surgery for spina bifida in an early gestation fetus (22-week gestation fetus) with a successful outcome. Open fetal surgery for myelomeningocele involves surgically opening the pregnant mother's abdomen and uterus to operate on the fetus. The exposed fetal spinal cord is covered in layers with surrounding fetal tissue at mid-gestation (19–25 weeks) to protect it from further damage caused by prolonged exposure to amniotic fluid. Between 1998 and 2003, Dr. Adzick, and his colleagues in the Center for Fetal Diagnosis and Treatment at The Children's Hospital Of Philadelphia, performed prenatal spina bifida repair in 58 mothers and observed significant benefit in the babies. Fetal surgery after 25 weeks has not shown benefit in subsequent studies. Management of myelomeningocele study (MOMS) was a phase III clinical trial designed to compare two approaches to the treatment of spina bifida: surgery before birth and surgery after birth. The trial concluded that the outcomes after prenatal spina bifida treatment are improved to the degree that the benefits of the surgery outweigh the maternal risks. This conclusion requires a value judgment on the relative value of fetal and maternal outcomes on which opinion is still divided. At one year of age, 40 percent of the children in the prenatal surgery group had received a shunt, compared to 83 percent of the children in the postnatal group. During pregnancy, all the fetuses in the trial had hindbrain herniation. However, at age 12 months, one-third (36 percent) of the infants in the prenatal surgery group no longer had any evidence of hindbrain herniation, compared to only 4 percent in the postnatal surgery group. Further surveillance is ongoing. In contrast to the open fetal operative approach performed in the MOMS trial, a minimally invasive fetoscopic approach (akin to 'keyhole' surgery) has been developed. This approach has been evaluated by independent authors of a controlled study which showed some benefit in survivors, but others are more skeptical. The observations in mothers and their fetuses that were operated over the past two and a half years by the matured minimally invasive approach showed the following results: Compared to the open fetal surgery technique, fetoscopic repair of myelomeningocele results in far less surgical trauma to the mother, as large incisions of her abdomen and uterus are not required. In contrast, the initial punctures have a diameter of 1.2 mm only. As a result, thinning of the uterine wall or dehiscence which have been among the most worriesome and criticized complications after the open operative approach do not occur following minimally invasive fetoscopic closure of spina bifida aperta. The risks of maternal chorioamnionitis or fetal death as a result of the fetoscopic procedure run below 5%. Women are discharged home from hospital one week after the procedure. There is no need for chronic administration of tocolytic agents since postoperative uterine contractions are barely ever observed. The current cost of the entire fetoscopic procedure, including hospital stay, drugs, perioperative clinical, ECG, ultrasound and MRI-examinations, is approximately €16,000. In 2012, these results of the fetoscopic approach were presented at various national and international meetings, among them at the 1st European Symposium “Fetal Surgery for Spina bifida“ in April 2012 in Giessen, at the 15th Congress of the German Society for Prenatal Medicine and Obstetrics in May 2012 in Bonn, at the World Congress of the Fetal Medicine Foundation in June 2012 and at the World Congress of the International Society of Obstetrics and Gynecology (ISUOG) in Copenhagen in September 2012, and published in abstract form. Since then more data has emerged. In 2014, two papers were published on fifty one patients. These papers suggested that the risk to the mother is small. The main risk appears to be preterm labour, on average at about 33 weeks. ^ a b c d e "Spina Bifida: Condition Information". 2012-11-30. Archived from the original on 2015-05-18. ^ a b c d "Are there disorders or conditions associated with spina bifida?". 2012-11-30. Archived from the original on 18 May 2015. Retrieved 8 May 2015. ^ a b c d e f g h i "What causes spina bifida?". 2012-11-30. Archived from the original on 18 May 2015. Retrieved 8 May 2015. ^ a b c d e f g "How many people are affected by or at risk for spina bifida?". 2012-11-30. Archived from the original on 18 May 2015. Retrieved 8 May 2015. ^ a b c d e "How do health care providers diagnose spina bifida?". 2012-11-30. Archived from the original on 18 May 2015. Retrieved 8 May 2015. ^ a b c d e "What are the treatments for spina bifida & related conditions?". 2012-11-30. Archived from the original on 18 May 2015. Retrieved 8 May 2015. ^ a b c Kondo, A; Kamihira, O; Ozawa, H (January 2009). "Neural tube defects: prevalence, etiology and prevention". International Journal of Urology. 16 (1): 49–57. doi:10.1111/j.1442-2042.2008.02163.x. PMID 19120526. ^ a b c d "Spina Bifida Fact Sheet | National Institute of Neurological Disorders and Stroke". www.ninds.nih.gov. 9 May 2017. Retrieved 30 March 2018. ^ Deming, Laura (2011). Pediatric life care planning and case management (2nd ed.). Boca Raton, FL: CRC Press. p. 392. ISBN 9781439803585. ^ a b "Neural Tube Defects (NTDs): Overview". 2012-11-30. Archived from the original on 9 May 2015. Retrieved 8 May 2015. ^ Castillo-Lancellotti, C; Tur, JA; Uauy, R (May 2013). "Impact of folic acid fortification of flour on neural tube defects: a systematic review". Public Health Nutrition. 16 (5): 901–11. doi:10.1017/s1368980012003576. PMID 22850218. ^ a b c M. Memet Ö̈zek (2008). Spina bifida : management and outcome. Milan: Springer. p. 58. ISBN 9788847006508. ^ Canfield, MA; Honein, MA; Yuskiv, N; Xing, J; Mai, CT; Collins, JS; Devine, O; Petrini, J; Ramadhani, TA; Hobbs, CA; Kirby, RS (November 2006). "National estimates and race/ethnic-specific variation of selected birth defects in the United States, 1999–2001". Birth Defects Research. Part A, Clinical and Molecular Teratology. 76 (11): 747–56. doi:10.1002/bdra.20294. PMID 17051527. ^ a b Bhide, P; Sagoo, GS; Moorthie, S; Burton, H; Kar, A (July 2013). "Systematic review of birth prevalence of neural tube defects in India". Birth Defects Research. Part A, Clinical and Molecular Teratology. 97 (7): 437–43. doi:10.1002/bdra.23153. PMID 23873811. ^ a b Puri, Prem (2011). Newborn surgery (3 ed.). London: Hodder Arnold. p. 811. ISBN 9781444149494. ^ a b Ferri, Fred F. (2016). Ferri's Clinical Advisor 2017: 5 Books in 1. Elsevier Health Sciences. p. 1188.e2. ISBN 9780323448383. ^ "Are There Different Types Of Spina Bifida?". SBA. Archived from the original on 5 May 2014. Retrieved 22 February 2012. ^ a b Foster, Mark R. "Spina Bifida". Archived from the original on 2008-05-13. Retrieved 2008-05-17. ^ a b "Spina Bifida Occulta". SBA. Archived from the original on 16 April 2013. Retrieved 22 February 2012. ^ van Tulder MW, Assendelft WJ, Koes BW, Bouter LM (1997). "Spinal radiographic findings and nonspecific low back pain. A systematic review of observational studies". Spine. 22 (4): 427–34. doi:10.1097/00007632-199702150-00015. PMID 9055372. ^ Iwamoto J, Abe H, Tsukimura Y, Wakano K (2005). "Relationship between radiographic abnormalities of lumbar spine and incidence of low back pain in high school rugby players: a prospective study". Scandinavian Journal of Medicine & Science in Sports. 15 (3): 163–68. doi:10.1111/j.1600-0838.2004.00414.x. PMID 15885037. ^ Iwamoto J, Abe H, Tsukimura Y, Wakano K (2004). "Relationship between radiographic abnormalities of lumbar spine and incidence of low back pain in high school and college football players: a prospective study". American Journal of Sports Medicine. 32 (3): 781–86. doi:10.1177/0363546503261721. PMID 15090397. ^ Steinberg EL, Luger E, Arbel R, Menachem A, Dekel S (2003). "A comparative roentgenographic analysis of the lumbar spine in male army recruits with and without lower back pain". Clinical Radiology. 58 (12): 985–89. doi:10.1016/S0009-9260(03)00296-4. PMID 14654032. ^ Taskaynatan MA, Izci Y, Ozgul A, Hazneci B, Dursun H, Kalyon TA (2005). "Clinical significance of congenital lumbosacral malformations in young male population with prolonged low back pain". Spine. 30 (8): E210–13. doi:10.1097/01.brs.0000158950.84470.2a. PMID 15834319. ^ Avrahami E, Frishman E, Fridman Z, Azor M (1994). "Spina bifida occulta of S1 is not an innocent finding". Spine. 19 (1): 12–15. doi:10.1097/00007632-199401000-00003. PMID 8153797. ^ Saladin, K.S. (2010). Anatomy & Physiology: Unity of Form and Function. Mc_Graw Hill. p. 482. ISBN 9780077905750. ^ a b c d Mitchell, L. E.; Adzick, N. S.; Melchionne, J.; Pasquariello, P. S.; Sutton, L. N.; Whitehead, A. S. (2004). "Spina bifida". Lancet. 364 (9448): 1885–95. doi:10.1016/S0140-6736(04)17445-X. PMID 15555669. ^ a b c d Juranek, J; Salman MS (2010). "Anomalous development of brain structure and function in spina bifida myelomeningocele". Developmental Disabilities. 1. 16 (1): 23–30. doi:10.1002/ddrr.88. PMC 2917986. PMID 20419768. ^ "Protect Yourself From Latex Allergies: Plant Biologists And Immunochemists Develop Hypoallergenic Alternative To Latex". Science Daily. 1 December 2008. Archived from the original on 18 October 2012. Retrieved 12 October 2012. ^ "Tethered Spinal Cord Syndrome". AANS. Archived from the original on 2011-10-16. Retrieved 2011-10-23. ^ "Chiari Malformation Fact Sheet: National Institute of Neurological Disorders and Stroke (NINDS)". Ninds.nih.gov. 2011-09-16. Archived from the original on 2011-10-27. Retrieved 2011-10-23. ^ Barkovich, J (2005). Pediatric Neuroimaging. Philadelphia, PA: Lippincott, Williams & Wilkens. ^ a b Wills, KE (1993). "Neuropsychological functioning in children with spina bifida and/or hydrocephalus". Journal of Clinical Child Psychology. 22 (2): 247–65. doi:10.1207/s15374424jccp2202_11. ^ a b Burmeister, R; Hannay HJ; Copeland K; Fletcher JM; Boudousquie A; Dennis M (2005). "Attention problems and executive functions in children with spina bifida and hydrocephalus". Child Neuropsychology. 11 (3): 265–83. doi:10.1080/092970490911324. PMID 16036451. ^ a b Tarazi, RA; Zabel TA; Mahone EM (2008). "Age-related changes in executive function among children with spina bifida/hydrocephalus based on parent behavior ratings". The Clinical Neuropsychologist. 22 (4): 585–602. doi:10.1080/13854040701425940. PMC 2575658. PMID 17853154. ^ a b c Fletcher JM, Brookshire BL, Landry SH, Bohan TP, Davidson KC, et al. (1996). "Attentional skills and executive functions in children with early hydrocephalus". Developmental Neuropsychology. 12 (1): 53–76. doi:10.1080/87565649609540640. ^ Snow, JH (1999). "Executive processes for children with spina bifida". Children's Health Care. 28 (3): 241–53. doi:10.1207/s15326888chc2803_3. ^ Rose, BM; Holmbeck GN (2007). "Attention and executive functions in adolescents with spina bifida". Journal of Pediatric Psychology. 32 (8): 983–94. doi:10.1093/jpepsy/jsm042. PMID 17556398. ^ Landry, SH; Robinson SS; Copeland D; Garner PW (1993). "Goal-directed behavior and perception of self-competence in children with spina bifida". Journal of Pediatric Psychology. 18 (3): 389–96. doi:10.1093/jpepsy/18.3.389. PMID 8340846. ^ Mayes, SD; Calhoun, SL (2006). "Frequency of reading, math, and writing disabilities in children with clinical disorders". Learning and Individual Differences. 16 (2): 145–57. doi:10.1016/j.lindif.2005.07.004. ^ a b Barnes, MA; Wilkinson, M; Khemani, E; Boudesquie, A; Dennis, M; Fletcher, JM (2006). "Arithmetic processing in children with spina bifida: Calculation accuracy, strategy use, and fact retrieval fluency". Journal of Learning Disabilities. 39 (2): 174–87. doi:10.1177/00222194060390020601. PMID 16583797. ^ Dennis, M; Barnes, M (2002). "Math and numeracy in young adults with spina bifida and hydrocephalus". Developmental Neuropsychology. 21 (2): 141–55. doi:10.1207/S15326942DN2102_2. PMID 12139196. ^ a b Hetherington, R; Dennis M; Barnes M; Drake J; Gentili J (2006). "Functional outcome in young adults with spina bifida and hydrocephalus". Child's Nervous System. 22 (2): 117–24. doi:10.1007/s00381-005-1231-4. PMID 16170574. ^ a b English, LH; Barnes, MA; Taylor, HB; Landry, SH (2009). "Mathematical developmental development in spina bifida". Developmental Disabilities Research Reviews. 15 (1): 28–34. doi:10.1002/ddrr.48. PMC 3047453. PMID 19213013. ^ a b Barnes, M; Dennis M; Hetherington R (2004). "Reading and writing skills in young adults with spina bifida and hydrocephalus". Journal of the International Neuropsychological Society. 10 (5): 655–63. doi:10.1017/S1355617704105055. PMID 15327713. ^ Fletcher JM, Dennis M, Northrup H, Barnes AM, Hannay HJ, Francis, DF (2004). Spina bifida: Genes, brain, and development. International Review of Research in Mental Retardation. 29. pp. 63–117. doi:10.1016/S0074-7750(04)29003-6. ISBN 9780123662293. ^ "it is more often due to direct toxicity of the alcohol on the marrow. The macrocytosis of alcoholism usually reverses only after months of abstinence from alcohol". Archived from the original on 2014-07-15. ^ "Spina bifida Risk factors - Mayo Clinic". www.mayoclinic.org. Archived from the original on 2016-11-29. Retrieved 2016-11-29. ^ Holmes LB (1988). "Does taking vitamins at the time of conception prevent neural tube defects?". JAMA. 260 (21): 3181. doi:10.1001/jama.260.21.3181. PMID 3184398. ^ Milunsky A, Jick H, Jick SS, et al. (1989). "Multivitamin/folic acid supplementation in early pregnancy reduces the prevalence of neural tube defects". JAMA. 262 (20): 2847–52. doi:10.1001/jama.262.20.2847. PMID 2478730. ^ Mulinare J, Cordero JF, Erickson JD, Berry RJ (1988). "Periconceptional use of multivitamins and the occurrence of neural tube defects". JAMA. 260 (21): 3141–45. doi:10.1001/jama.1988.03410210053035. PMID 3184392. ^ "Folic Acid Fortification". FDA. February 1996. Archived from the original on 2009-09-18. ^ "Folic Acid - Public Health Agency of Canada". Archived from the original on 2006-09-27. ^ a b "Why do I need folic acid?". NHS Direct. 2006-04-27. Archived from the original on April 13, 2006. Retrieved 2006-08-19. ^ Kibar Z, Torban E, McDearmid JR, Reynolds A, Berghout J, Mathieu M, Kirillova I, De Marco P, Merello E, Hayes JM, Wallingford JB, Drapeau P, Capra V, Gros P (2007). "Mutations in VANGL1 associated with neural-tube defects". N. Engl. J. Med. 356 (14): 1432–37. doi:10.1056/NEJMoa060651. PMID 17409324. ^ "Medical malpractice: Childbirth, failed to perform AFP test" (PDF). Archived (PDF) from the original on 2016-03-03. ^ a b c d Adzick, NS (February 2013). "Fetal surgery for spina bifida: past, present, future". Seminars in Pediatric Surgery. 22 (1): 10–17. doi:10.1053/j.sempedsurg.2012.10.003. PMC 6225063. PMID 23395140. ^ Grivell, RM; Andersen, C; Dodd, JM (28 October 2014). "Prenatal versus postnatal repair procedures for spina bifida for improving infant and maternal outcomes". Cochrane Database of Systematic Reviews. 10 (10): CD008825. doi:10.1002/14651858.CD008825.pub2. PMID 25348498. ^ Joyeux, L; Chalouhi, GE; Ville, Y; Sapin, E (June 2014). "[Maternal-fetal surgery for spina bifida: future perspectives]". Journal de Gynécologie, Obstétrique et Biologie de la Reproduction. 43 (6): 443–54. doi:10.1016/j.jgyn.2014.01.014. PMID 24582882. ^ "Center for Spina Bifida: Specialists and Services". Gillette Children's Hospital Center for Spina Bifida. Gillette Children's Hospital. Archived from the original on 19 December 2010. Retrieved 15 November 2011. ^ a b Binks, JA; Barden WS; Burke TA; Young NL (2007). "What do we really know about the transition to adult-centered health care? A focus on cerebral palsy and spina bifida". Archives of Physical Medicine and Rehabilitation. 88 (8): 1064–73. doi:10.1016/j.apmr.2007.04.018. PMID 17678671. ^ Davis, BE; Shurtleff DB; Walker WO; Seidel KD; Duguay S (2006). "Acquisition of autonomy skills in adolescents with myelomeningocele". Developmental Medicine & Child Neurology. 48 (4): 253–58. doi:10.1017/S0012162206000569. PMID 16542511. ^ Friedman, D; Holmbeck GN; DeLucia C; Jandasek B; Zebracki K (2009). "Trajectories of autonomy development across the adolescent transition in children with spina bifida". Rehabilitation Psychology. 54 (1): 16–27. doi:10.1037/a0014279. PMID 19618699. ^ Monsen, RB (1992). "Autonomy, coping, and self-care agency in healthy adolescents and in adolescents with spina bifida". Journal of Pediatric Nursing. 7 (1): 9–13. PMID 1548569. ^ Holmbeck, GN; Devine KA (2010). "Psychosocial and family functioning in spina bifida". Developmental Disabilities Research Reviews. 16 (1): 40–46. doi:10.1002/ddrr.90. PMC 2926127. PMID 20419770. ^ a b Lemire RJ (1988). "Neural tube defects". JAMA. 259 (4): 558–62. doi:10.1001/jama.259.4.558. PMID 3275817. ^ a b Cotton P (1993). "Finding neural tube 'zippers' may let geneticists tailor prevention of defects". JAMA. 270 (14): 1663–4. doi:10.1001/jama.270.14.1663. PMID 8411482. ^ Boulet SL, Yang Q, Mai C, Kirby RS, Collins JS, Robbins JM, Mulinare J (2008). "Trends in postfortification prevalence of spina bifida and ancephaly in the United States". Birth Defects Research, Part A. 82 (7): 527–32. doi:10.1002/bdra.20468. PMID 18481813. ^ Meuli, M; Meuli-Simmen, C; Hutchins, GM; Yingling, CD; Hoffman, KM; Harrison, MR; Adzick, NS (April 1995). "In utero surgery rescues neurological function at birth in sheep with spina bifida". Nature Medicine. 1 (4): 342–47. doi:10.1038/nm0495-342. PMID 7585064. ^ Paek, BW; Farmer, DL; Wilkinson, CC; Albanese, CT; Peacock, W; Harrison, MR; Jennings, RW (2000). "Hindbrain herniation develops in surgically created myelomeningocele but is absent after repair in fetal lambs". American Journal of Obstetrics and Gynecology. 183 (5): 1119–23. doi:10.1067/mob.2000.108867. PMID 11084552. ^ Bouchard, S; Davey, MG; Rintoul, NE; Walsh, DS; Rorke, LB; Adzick, NS (March 2003). "Correction of hindbrain herniation and anatomy of the vermis after in utero repair of myelomeningocele in sheep". Journal of Pediatric Surgery. 38 (3): 451–58. doi:10.1053/jpsu.2003.50078. PMID 12632366. ^ Meuli, M; Meuli-Simmen, C; Yingling, CD; Hutchins, GM; Timmel, GB; Harrison, MR; Adzick, NS (March 1996). "In utero repair of experimental myelomeningocele saves neurological function at birth". Journal of Pediatric Surgery. 31 (3): 397–402. doi:10.1016/S0022-3468(96)90746-0. PMID 8708911. ^ Bruner, JP; Richards, WO; Tulipan, NB; Arney, TL (January 1999). "Endoscopic coverage of fetal myelomeningocele in utero". American Journal of Obstetrics and Gynecology. 180 (1 Pt 1): 153–58. doi:10.1016/S0002-9378(99)70167-5. PMID 9914596. ^ Adzick, N Scott; Sutton, Leslie N; Crombleholme, Timothy M; Flake, Alan W (1998). "Successful fetal surgery for spina bifida". The Lancet. 352 (9141): 1675–76. doi:10.1016/S0140-6736(98)00070-1. PMID 9853442. ^ Tubbs, RS; Chambers, MR; Smyth, MD; Bartolucci, AA; Bruner, JP; Tulipan, N; Oakes, WJ (March 2003). "Late gestational intrauterine myelomeningocele repair does not improve lower extremity function". Pediatric Neurosurgery. 38 (3): 128–32. doi:10.1159/000068818. PMID 12601237. ^ "Background of Management of Myelomeningocele Study (MOMS)". The GWU Biostatistics Center. Archived from the original on 2012-09-23. Retrieved 2012-08-06. ^ "Management of Myelomeningocele Study (MOMS)". ClinicalTrials.gov. Archived from the original on 2015-09-08. Retrieved 2012-08-06. ^ Adzick, NS; Thom, Elizabeth A.; Spong, Catherine Y.; Brock, John W.; Burrows, Pamela K.; Johnson, Mark P.; Howell, Lori J.; Farrell, Jody A.; et al. (February 9, 2011). "A Randomized Trial of Prenatal versus Postnatal Repair of Myelomeningocele". New England Journal of Medicine. Online First. 364 (11): 993–1004. doi:10.1056/NEJMoa1014379. PMC 3770179. PMID 21306277. ^ "Management of Myelomeningocele Study (MOMS)". Archived from the original on 2016-03-05. ^ Verbeek, Renate J (2011). "Fetal endoscopic myelomeningocele closure preserves segmental neurological function". Developmental Medicine. 54 (1): 15–22. doi:10.1111/j.1469-8749.2011.04148.x. PMID 22126123. ^ Shurtleff, David (2011). "Fetal endoscopic myelomeningocele repair". Developmental Medicine & Child Neurology. 54 (1): 4–5. doi:10.1111/j.1469-8749.2011.04141.x. PMID 22126087. ^ Verbeek R, Heep A, et al. (15 December 2010). "Does fetal endoscopic closure of the myelomeningocele prevent loss of neurologic function in spina bifida aperta?". Cerebrospinal Fluid Research. 7 (1): S18. doi:10.1186/1743-8454-7-S1-S18. PMC 3026494. ^ Farmer DL, von Koch CS, Peacock WJ, Danielpour M, Gupta N, Lee H, Harrison MR (2003). "In utero repair of myelomeningocele: experimental pathophysiology, initial clinical experience, and outcomes". Arch Surg. 138 (8): 872–78. doi:10.1001/archsurg.138.8.872. PMID 12912746. ^ Kohl T, Gembruch U (2008). "Current status and prospects of fetoscopic surgery for spina bifida in human fetuses". Fetal Diagn Ther. 24 (3): 318–20. doi:10.1159/000158549. PMID 18832851. ^ "DZFT beim Kongress DGPGM | DZFT". Dzft.de. Archived from the original on 2014-01-16. Retrieved 2012-11-14. ^ "The Fetal Medicine Foundation / FMF World Congress". Fetalmedicine.com. Archived from the original on 2012-11-24. Retrieved 2012-11-14. ^ "World Congress 2012". ISUOG. 2012-09-13. Archived from the original on 2012-11-15. Retrieved 2012-11-14. ^ Degenhardt J, Schürg R, Kawecki A, Pawlik M, Enzensberger C, Stressig R, Tchatcheva K, Axt-Fliedner R, Kohl T, et al. (2012). "Mütterliches Outcome nach minimal-invasivem Verschluss einer Spina bifida". Ultraschall in Med. 33: S96. doi:10.1055/s-0032-1322728. ^ Neubauer B, Degenhardt J, Axt-Fliedner R, Kohl T (2012). "Frühe neurologische Befunde von Säuglingen nach minimal-invasivem fetoskopischen Verschluss ihrer Spina bifida aperta". Z Geburtsh Neonat. 216 (2): 87. doi:10.1055/s-0032-1309110. ^ Degenhardt J, Kawecki A, Enzensberger C, Stressig R, Axt-Fliedner R, Kohl T (2012). "Rückverlagerung der Chiari-II Malformation innerhalb weniger Tage nach minimal-invasivem Patchverschluss ans Hinweis für einen effektiven Verschluss der Fehlbildung". Ultraschall in Med. 33: S95. doi:10.1055/s-0032-1322725. ^ Kohl Thomas (2014). "Percutaneous minimally invasive fetoscopic surgery for spina bifida aperta. Part I: surgical technique and perioperative outcome". Ultrasound Obstet Gynecol. 44 (5): 515–24. doi:10.1002/uog.13430. PMID 24891102. ^ Degenhardt J; et al. (2014). "Percutaneous minimal-access fetoscopic surgery for spina aperta. Part II: maternal management and outcome". Ultrasound Obstet Gynecol. 44 (5): 525–31. doi:10.1002/uog.13389.